TV on the Radio comes to Hollywood Palladium on Friday 3rd April 2015! One of most innovative bands of the 2000s, this Brooklyn-based band blends a mix of electronic, indie guitar rock, free jazz, funk, soul and a cappella doo-wop vocals, into a vibrant and arty sound that recalls the likes of Funkadelic, the Beach Boys, the Jesus and Mary Chain, Otis Redding and even Aphex Twin. Their freedom with genres is what makes them – “It’s about doing what feels right,” says singer Tunde Adebimpe. Their music is accessible to everyone, which makes them unique. Don't miss this electrifying energetic show, grab the chance while you can! 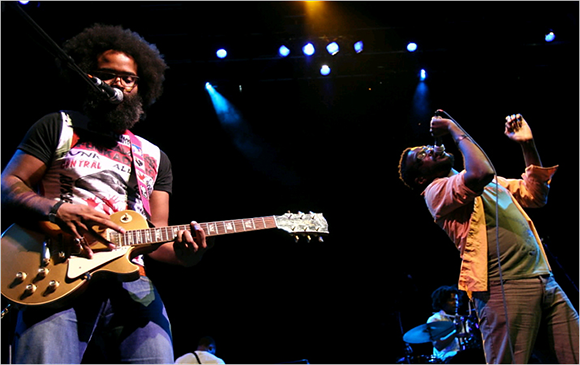 From their beginnings as Brooklyn-based experimenters to one of the most acclaimed bands of the 2000s and 2010s, TV on the Radio mixed post-punk, electronic, and other atmospheric elements in vibrantly creative ways, and are both visual artists as well as musicians. The band's fourth album, Dear Science, was released September 23, 2008 on Interscope. It was made available for streaming on their Myspace page and subsequently leaked onto the internet on September 6, 2008. The album received widespread critical acclaim. It was named the best album of 2008 by Rolling Stone, The Guardian, Spin magazine, The Onion AV Club, MTV, Entertainment Weekly, the Pitchfork Media's readers poll as well as the Pazz and Jop critic's poll. It was also named the second best album of 2008 by NME and the fourth best album of 2008 by Planet Sound! You could almost list whatever genre you want, and it'd make sense: doo-wop, electronica, hip-hop, New Wave, post-rock, post-punk, various strands of art-rock, and so on. which is why their music appeals to all.